This morning’s broadcast began with live coverage of the Asiana flight 214 crash in San Francisco, and then turned to the crisis in Egypt. 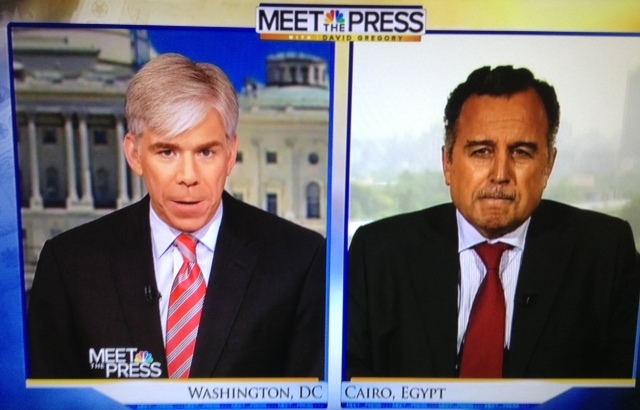 Meet the Press was supposed to feature an exclusive interview with opposition leader Dr. Mohammed Elbaradei. Dr. Elbaradei was named prime minister of Egypt yesterday before his name was withdrawn by the Egyptian interim president’s office. Gregory then turned to Nabil Fahmy the former ambassador of Egypt to the United States. Gregory said that Fahmy has been mentioned as a potential foreign minister of Egypt in the interim government. Fahmy defended the role of the military and predicted a return to democratic processes very soon in Egypt. Jeff Goldberg of Bloomberg called the events in Egypt a victory for progressivism and a defeat for democracy. He said we know the Muslim brotherhood are a totalitarian fundamentalist party and that their removal from power is good for women and Christians and others in Egypt. But we can also predict, he said, that it won’t be the last time the military plays a role in the political process. Goldberg said, “If there had just been some patience on the part of liberals, the Muslim Brotherhood might have imploded on their own accord.” Now Goldberg worries the Muslim Brotherhood can be seen as martyrs and may get more involved in terrorism. Later Gregory quoted Shadi Hamid of Brookings making much the same point about the potential now for the brotherhood to become more involved in terrorism and to blame the United States for their fate. NBC’s Andrea Mitchell pointed out that democracy is not necessarily synonymous with free and fair elections. NBC’s Chuck Todd said for the first time he sees some doubt in the Obama White House about the prospects of immigration reform passing both houses of Congress this year.